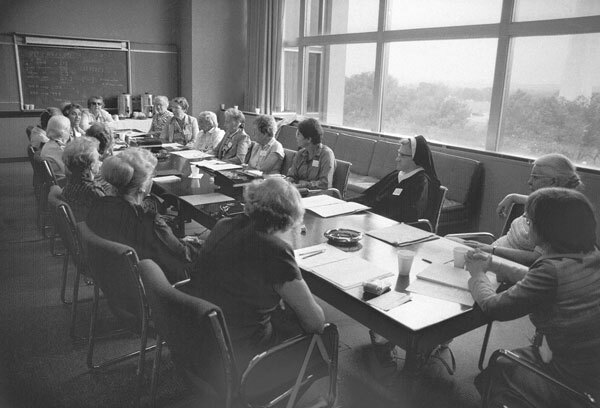 On August 31, 1981, the Division of Mathematics of NMAH sponsored an all-day meeting honoring American women who received PhD’s in mathematics prior to World War II. Fifteen women, all of whom had received their doctorates in the period 1929 through 1940, attended the meeting. The meeting was presided over by the division’s curator, Uta C. Merzbach, who was assisted by two honorary research associates in the division, Judy Green and Jeanne LaDuke. All three organizers also held PhD’s in mathematics, which were awarded several decades after World War II. The meeting was recorded and questionnaires were prepared to collect and verify biographical and bibliographical information about the women invited to the meeting as well as any husband or other relative who was also a mathematician. 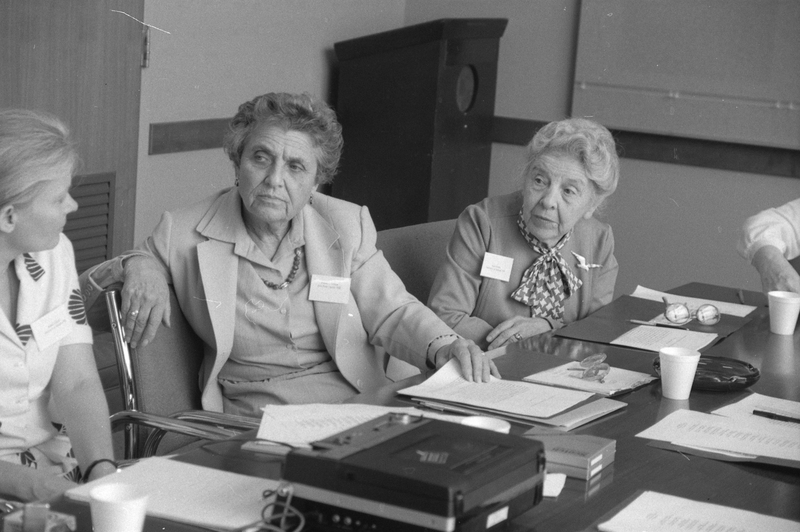 The corrected versions of these questionnaires and related photographs are preserved in the collections along with reel-to-reel tapes documenting the proceedings of the meeting and questionnaires collected from other women mathematicians. There are questionnaires in the collection for five mathematical couples and two father/daughter pairs of mathematicians. Although there are no questionnaires for them in the collection, there were several mother/child pairs of mathematicians among the American women with pre-World War II PhD’s in mathematics. The following is a list, mainly of women mathematicians, of those who submitted biographical and bibliographical information about themselves to the Division of Mathematics of NMAH. Many of these women attended a 1981 meeting at the Museum that honored American women who received PhDs in mathematics prior to World War II. Others on the list later submitted the same sort of information to the division between 1981 and 1987. Also on this list are seven male mathematicians, two of whom are fathers of women on the list and five of whom are husbands of women on the list. With the exception of Vera (Ames) Widder (1909–2004), Bryn Mawr College, 1938, all those who attended the 1981 meeting returned questionnaires. For each person listed we give name, dates of birth and death, school awarding doctorate, and year of that degree. A name in parentheses is the surname before marriage, and a number in parentheses at the end of an entry refers to a comment following the list. An asterisk before a name means that the woman attended the 1981 meeting. (1) R. P. Baker was the father of Frances E. Baker, who completed his questionnaire. (2) Margarete D. Darkow’s questionnaire was completed by her sister, Felice E. Darkow. (3) Orrin Frink was the husband of Aline Huke Frink. (4) Anna M. C. Grant’s questionnaire was annotated after her death by her niece, Jessie F. Flouton. (5) There is no questionnaire from Bella Greenfield, only a curriculum vitae. (6) Clifton Terrell Hazard was the father of Katharine E. Hazard, who completed his questionnaire. He did not possess a PhD but was a professor of mathematics at Purdue University. (7) Ernest A. Hedberg was the husband of Marguerite Zeigel Hedberg, who completed his questionnaire. (8) Ralph E. Huston was the husband of Antoinette Killen Huston, who completed his questionnaire. (9) A. J. Maria was the husband of May Hickey Maria, who completed his questionnaire. (10) There is no questionnaire from Joanna Isabel Mayer, only correspondence. (11) Adrienne S. Rayl submitted a questionnaire completed with the assistance of her nephew, Donald R. Wilken. (12) R. K. Wakerling was the husband of Virginia W. Wakerling. The following is a list of mathematicians, all but one a woman, who provided photographs when they submitted biographical and bibliographical information in the years 1981 through 1987 (for this information, see 2006.3037.01). Unless otherwise indicated, there is one black and white photograph for each person listed. In a few cases, other items related to a woman are listed.